ARDBOE or Ard Bó – a thin place in County Tyrone. In Irish the name means Height of the Cow. 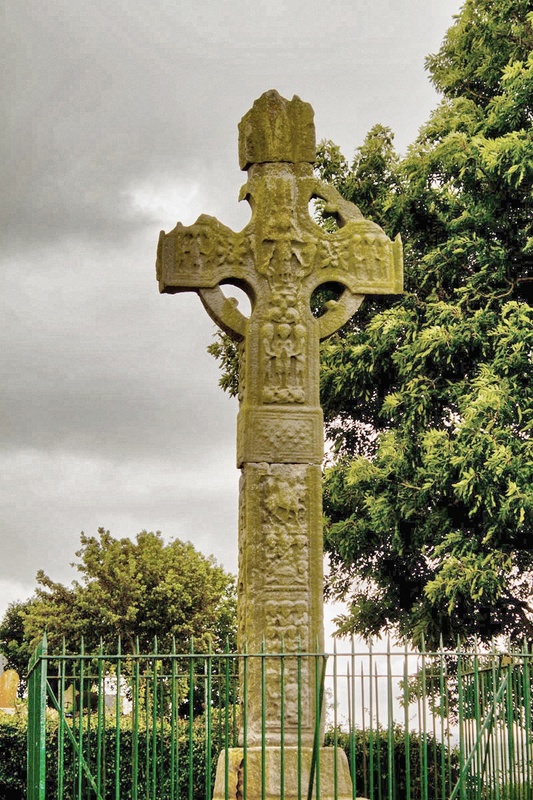 The Ardboe high cross stands 18 feet high on the shores of Lough Neagh. It has 20 scenes from the Old Testament carved into its shaft that are still quite clear even after centuries of weathering out in the elements. This and similar high crosses throughout Ireland were teaching tools used by the monks for religious education. In the early days of the Church, few villagers or farmers could read, so the bible scenes on the cross were used as a way to illustrate the lessons of the new Christian religion. St. Colman founded a monastery in the 7th century on this site and built a church. The name Ardboe came from a legend that the mortar used to build that church came from a magic cow that emerged from the lough (Lough Neagh) that had gone dry. The milk from that cow gave strength to the builders as well as the building. In the 16th century, that old church built by St. Colman gave way to a new church – a church that still stands today as a crumbling ruin on the shores of Lough Neagh, clinging to that holy space, drawing its energy. Lough Neagh is linked to enchantment, believed to be a dwelling place for the fairies. One of tales of Lough Neagh’s origin is that Finn MacCool, the famous Irish giant from Ulster, was chasing his arch-rival from Scotland and the rival was getting ahead of him. Finn MacCool reached down and scooped up a handful of dirt and stone and flung it at the fleeing Scottish giant, missing him by miles. The dirt and stone fell into the Irish Sea and became the Isle of Mann. The hole left in the ground from where Finn scooped up the dirt, became Lough Neagh. The Lough is now the largest freshwater lake in Ireland and Britain, covering 151 square miles and touching five of the six counties of Northern Ireland. For centuries people have believed that its waters have healing powers. The energy around Ardboe is palpable. It is likely that the land where the monks of St. Colman built the church was already identified as a sacred site. When approaching Ardboe cross and church, one is called to be still. The entire landscape of water, grass, trees and stone is knitted together with a kind of oneness that clings to its past — even while sitting in the present. To approach Ardboe is to walk into that time of St. Colman and the time of the people before him who also worshiped and prayed at this sacred, thin place. I’m not the only who has felt that special energy of Ardboe. My friend, Maura Brooks, a native of County Tyrone so believes in the mystical energy of Ardboe that she brings travelers to the site on a regular basis. It is Maura who introduced me to Ardboe, and she’s produced a short video about it that give some great commentary from a local perspective. The position of the small primitive group of holy buildings silhouetted against water and sky affects us, and most visitors, to initial stillness and silence. 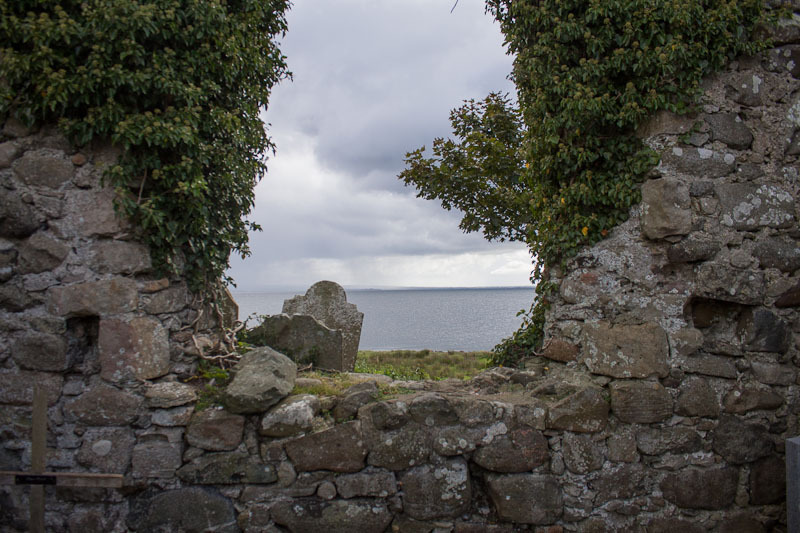 The crumbling arched windows frame the perpetual movement of the small crested waves of the lough. Ardboe is a thin place. 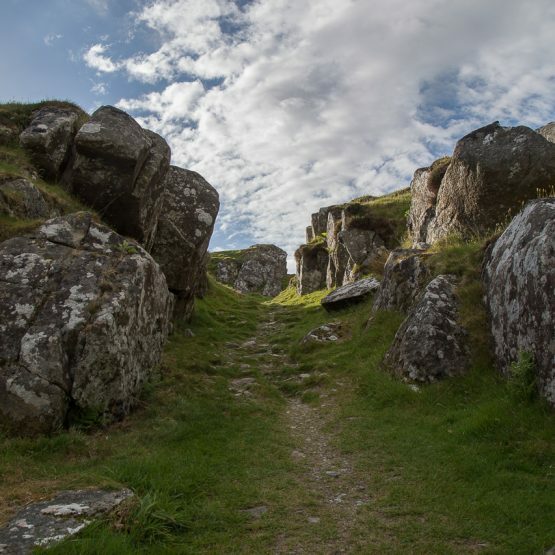 It is a stop on our Thin Places tour of Northern Ireland in Sept. 2018.